HOUSTON BRAVES COLD TEMPERATURES, WIND AND RAIN TO SHARE HER MESSAGE WITH PATRONS ATTENDING THE 143RD RACE FOR THE ROSES. The weather forecast for the May 5th and May 6th, 2017 Kentucky Derby festivities was up in the air at best. But that made little difference to police brutality survivor Antwynette Houston whose commitment to protest the City of Louisville for its failure to negotiate a fair outcome of her police brutality case was very evident. Antwynette Houston braves the cold weather during her 2017 Kentucky Derby protest. Photo Courtesy: beenetworknews / A. Houston . Both days Houston braved unseasonably cloudy and cold weather accompanied by steady rain along with temperatures ranging from the mid 40’s to 50’s over the two-day period with moments of bright sunshine between the rains. A typical temperature around this time of year is in the 70’s. With the aid of heaters on her porch, she staked out a position and refused to be deterred. 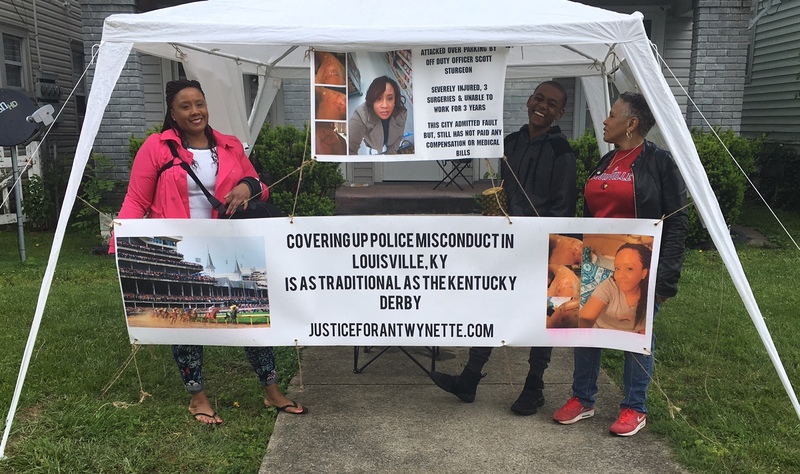 It was last year on May 7th of 2016 that Antwynette Houston first shared her story with visitors attending the 142nd running of the Kentucky Derby. Her petition on Change.org drew support from people living in France, United Kingdom, Canada, Italy, South Africa, Ireland, South Korea, Grenada and the U.S. Virgin Islands. Residents living in states such as; New York, California, North Carolina, Kentucky, District of Columbia, Missouri, Texas, Maryland, Idaho, Indiana, Virginia, Washington, Ohio, Georgia, Florida, Oklahoma, Colorado, New Jersey, Pennsylvania, Arkansas, Minnesota, Illinois, Tennessee, Wisconsin, Alabama, South Carolina, Arizona, Oregon, Mississippi, Nebraska, Louisiana, West Virginia, Delaware, Massachusetts and Nevada supported her as well and continue to do so. All expressed one simple sentiment – that Justice for Houston and her son should be immediate; and that the emotional, physical and financial burden unfairly placed on them end with a fair and just result. It was the early morning of August 3, 2013, around 3 a.m. when Houston was attacked by former Louisville Metro Police Department (LMPD) officer Scott Sturgeon who was off duty at the time of the incident. She had just returned from an out-of-town funeral and stopped at a gas station for a snack on the way home. Her son who was nine-years-old at the time was sleeping in the backseat. The incident stemmed from a verbal altercation over a parking space, which was initiated by the police officer. The end result was that the officer completely separated her shoulder creating a rare injury known as Quadrilateral space syndrome accompanied by other severe injuries. To date she has had four surgical operations on her shoulder and continues to struggle with pain and limited use of her arm. It’s a fact that historically, deep segregation and racism existed in Louisville. It was that very racism accompanied by two incidents; a New York Times report saying that Ali was publicly referred to in Louisville as ‘the Olympic ni**er, and a restaurant incident where he was refused service because of his skin color that caused a young 18-year-old Cassius Clay to go to the Second Street bridge and hurl his medal into the Ohio River. Some Louisville citizens believe the city has come a long way since then, but others feel the city hasn’t come far enough. Houston and her supporters believe the latter.